I'll try to look into this again next weekend. I think Elisa was missing some way to go properly from Now Playing to a specific album view, so it went straight to all albums. januz removed a watcher for Elisa: januz. 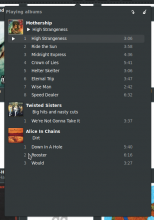 januz added a comment to D14120: Tweak inital state for playlist. Hi guys, sorry I've been dropping the ball on this one. I had reverted this some weeks ago but couldn't find another way to center it. And then I didn't have time to get back on it. This is mostly done too but there's still one small bug: when I go to the now playing view and then click on the album name it doesn't open the album, but only switches to the album view. januz updated the diff for D14018: Make labels in header bar clickeable. januz updated the diff for D14120: Tweak inital state for playlist. januz added a comment to D14736: Add a mode where all the bottom part can be hidden. Hey, great! I can't see the bug anymore. The only thing that's missing now is toggling when the window is maximized, right now the button switches but there's no change in the UI. BTW, maximizing the UI + window looks awesome. Specially with high-res covers. For the moment, I've only implemented the button for hiding the bottom part. How can I detect if I'm in the party mode or in the minimal mode? januz requested changes to D14736: Add a mode where all the bottom part can be hidden. januz awarded D12290: Don't draw list dividers a Like token. januz committed R255:f3f15b0f62a1: New header style for playlist (authored by januz). januz closed D14015: New header style for playlist. januz added a comment to T7884: file browser. Do you mean this as a wish? They are left aligned, which is also consistent with the other views. januz awarded M128: Plasma Sets a 100 token. januz added a project to D14120: Tweak inital state for playlist: Elisa. januz requested review of D14120: Tweak inital state for playlist. januz accepted D14080: add albumId role to MediaPlayList and use it in ManageHeaderBar. januz updated the diff for D14015: New header style for playlist. januz added a comment to D14015: New header style for playlist. Looks like ToolButtons ignore text. I managed to hack this by shoving a Text object inside them but it really messes up the layout and only the icon is clickable. How about putting the icons on top and making them toolbuttons without a visible button-looking border? There's plenty of unused vertical space there, and square buttons might fit well in the available space. There is some room, but it ends up looking more cramped. januz accepted D14084: always display the title of the playlist entries. LGTM. Tested this by adding MOD files to the playlist and now they show up correctly. One small issue is that they are all inside a blank album (with only a CD icon) which looks a bit strange but that's a topic for another patch. januz added a comment to D14080: add albumId role to MediaPlayList and use it in ManageHeaderBar. Hey, thanks for working on this. I tried this in the links branch but it seems all albums are giving back zero (even after deleting/rebuilding the db). januz committed R255:8e519573210f: Allow playlist to be hidden (authored by januz). januz closed D13834: Allow playlist to be hidden. januz added inline comments to D13834: Allow playlist to be hidden. januz updated the diff for D13834: Allow playlist to be hidden. januz added a comment to D13834: Allow playlist to be hidden. I don't quite understand what you guys mean by a different workflow. I downloaded Lollypop to try it out, but the workflow is almost the same as Elisa for me. There's a global playlist (in a popup), if you click the play button the playlist is cleared and replaced, and you can click the + button to enqueue. I do not know Lolypop very well. I meant players in general where you do not see an explicit global playlist but where you just play the music currently shown. Some people kept asking for an iTunes like behavior. I also do not know it but I understood that it was optimized to work well without a global playlist. januz awarded D14046: [effects/desktopgrid] Don't change activities a Party Time token. januz updated subscribers of D14015: New header style for playlist. Good point in the ellipsis. The broom icon is way better but I'm going to wait for confirmation from @mgallien or @astippich since we are on 5.45 now. januz added a comment to T9153: Global shortcuts. Thinking a bit more about this, we might want to use PgUp/ PgDn to scroll in the playlist/content views so maybe we should go straight for the chord. januz updated the summary of D14018: Make labels in header bar clickeable. This patch isn't finished yet. 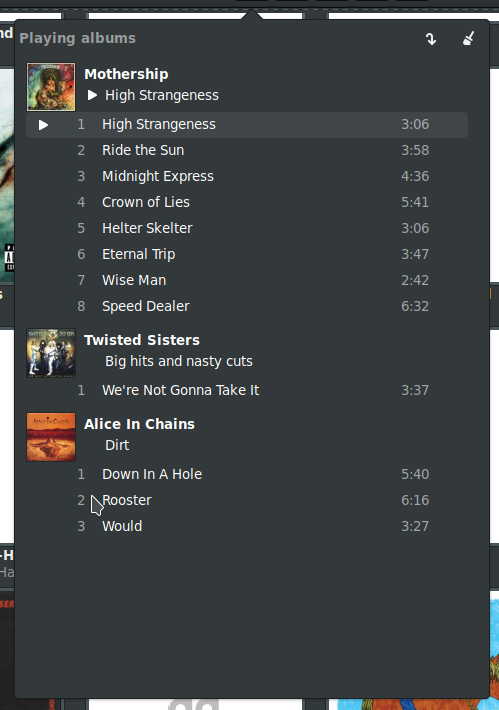 I've come across a problem with the album view: the openOneAlbum() function requires a databaseID to get the album data but I have no way of getting that in the header bar. I looked around the headerbarmanager code for a bit but I have no idea how we could fetch that. Everything else works. januz added a project to D14018: Make labels in header bar clickeable: Elisa. januz requested review of D14018: Make labels in header bar clickeable. 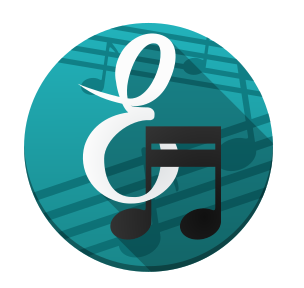 januz added a project to D14015: New header style for playlist: Elisa. januz requested review of D14015: New header style for playlist. @ngraham Good point about Ctrl+T , I tried to make them mnemonic but I can see how it could be confusing. What do you think about F9? It's used by the place's panel in Dolphin, so it's a bit similar. januz triaged T9153: Global shortcuts as Wishlist priority. januz updated the summary of D13834: Allow playlist to be hidden. januz added a comment to D12841: Align view buttons vertically. Sorry for the big delay on my side. Let's get it in the 0.2 branch. It is much better with than without it. We will do a real 0.2.1 with stuff being fixed !!! januz committed R255:b1846b212f86: Align view buttons vertically (authored by januz). januz closed D12841: Align view buttons vertically. There's one small thing left to do for this one: add a customizable shortcut. I couldn't figure out how to do it though, should I add the action in C++ to do that? januz added a project to D13834: Allow playlist to be hidden: Elisa. januz requested review of D13834: Allow playlist to be hidden. januz accepted D13639: move the playing indicator to be first on line and align titles. januz added a comment to D13639: move the playing indicator to be first on line and align titles. Unfortunately, I have not yet found a reliable way to get light text with all fonts. Some work, some does not work. Every track has the multi-disc format now (1/2, 1/3, etc.) even when they are not multi disc. Some individual tracks show " / 1". The screen you shared earlier had the track numbers and artist names in a lighter grey, did you decide against it? I can see what you mean, the alternating colors would look weird if they go across albums. The other option could be making the alternating colors "local" to albums, but I'm not sure how we could do that since we can't rely on track numbers. Did you had a look at the last screenshot where all album headers have a third color distinct from the rows ? The difference may be too small but at the same time, I am a bit lost on which solution apply. januz awarded D13700: implement reading of the replaygain tags a 100 token. januz accepted D13681: fix artist being empty when they are only used as album artists. januz added a comment to D13481: Recommend window border size "None". +1 I've been using borderless windows all the time since I came back to KDE Plasma and haven't had any workflow issues. januz requested changes to D13639: move the playing indicator to be first on line and align titles. januz added a comment to D12975: Hide stars when there is no rating. januz committed R255:f9eafddd068c: Hide stars when there is no rating (authored by januz). januz closed D12975: Hide stars when there is no rating. Here's a new solution for alignment. It should stay in mostly the same place with different fonts, unless you are using some weird fantasy font with bad metrics. I tried increasing the font size to 14 (OK, this is a corner case) and the bottom of the buttons are no longer aligned. Did you consider using TextMetrics to get the exact height of the label ? januz updated the diff for D12975: Hide stars when there is no rating. januz added a comment to D13423: unmerge albums by using the paths of their tracks. When I tried this the first time I got this error and the loading animation running constantly. Tried this from master and it works really well. The thing that gets excites me the most is that Elisa can now play MOD files! I can confirm that .xm, .it, .mod and .s3m formats work. MIDI files are also recognized and shown but they failed to play for me. januz added a comment to T7883: year and genre browser. Tried this again from Master after nuking my DB. I get more genres (I think) but they are all empty and if I try to play them I get an empty playlist. januz updated the diff for D12841: Align view buttons vertically. januz added a comment to D12842: Tweak size and color of handles for the seek/volume sliders. januz committed R255:143347526272: Tweak size and color of handles for the seek/volume sliders (authored by januz). januz closed D12842: Tweak size and color of handles for the seek/volume sliders. januz added a comment to D12992: New elisa icon. casette. I also agree in that the casette felt off when looking at it. iconography on top could look good. Here's a test for the "columns" idea. januz updated the diff for D12842: Tweak size and color of handles for the seek/volume sliders. TBH I like the concept of the cassette icon more than the current implementation of it. What was good about about is that it had personality, which is a big deal since usually icons also double as logos. IMO a solid icon should be 1) Memorable and 2) Descriptive. Imagine both icons amongst these google search results and consider which one would stand out, which one you would know it's elisa's. These icons are technically great, they are just not memorable. Heh I thought this was only affecting desktops so it didn't need to be touchable, I completely forgot PCs have touchscreens too these days. I also prefer this one without the quaver. Is it possible to really simplify the background for the small size icon ? It would be probably much easier to read it. januz added a comment to D12951: fix several issues caused by the use of loaders for the music views. I don't think the buttons look so bad jumping around, after all there's only two positions they can be. However I think if we keep them in the same position (in the middle) but actually push them farther to the left we could create the illusion of columns, and it wouldn't look so weird. I'll take a look at it. januz awarded T8753: Launcher Menus Convergence a Like token. Could be dpi, are you using a high-dpi screen? Could you post a screen so I can see how far off it is? I'm thinking it could also be the system font. What font are you using? januz added a project to D12975: Hide stars when there is no rating: Elisa. januz requested review of D12975: Hide stars when there is no rating. januz accepted D12915: use more appropriate icon names for the tracks and play list views. Sorry I forgot to check albums with covers. januz added a project to D12842: Tweak size and color of handles for the seek/volume sliders: Elisa. januz requested review of D12842: Tweak size and color of handles for the seek/volume sliders. januz added a project to D12841: Align view buttons vertically: Elisa.